Formal gatherings and exclusive events are typically held during dinnertime for various reasons. Perhaps it’s the time given for organizers to prepare for the event and the availability of guests to attend it. 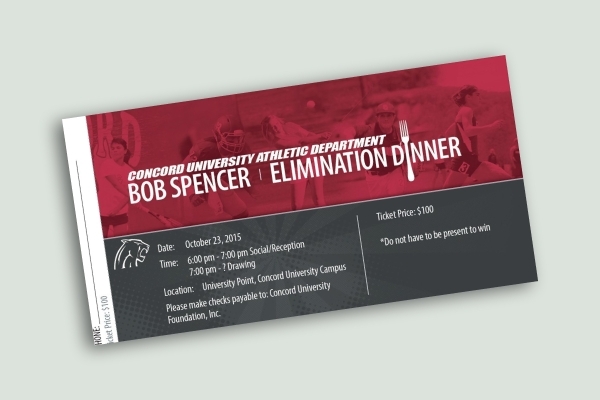 To invite customers or participants to these functions, dinner tickets are provided by a designated sponsor. Designing the ticket in a way that will bring attention to the event is extremely important to most organizers, considering how it paints a positive image in the eyes of attendees. That being said, here’s a collection of some of the best ticket templates and examples to inspire you. Hosting a dinner party is never easy. Apart from the food and venue arrangements, you also need to worry about potential gate crashers coming in to ruin everything you’ve invested your time and money on. Thus, it’s a good idea to hand out dinner tickets to guests at your event prior to the actual dinner date. These admission tickets will grant the holder entry to the dinner venue so you can easily monitor those who come in and out of your party. You can also use the ticket to guide guests to their tables in accordance with the seating chart that was planned. Any rules or policies that guests need to be aware of must be indicated in the ticket to avoid any issues during the day of the party. 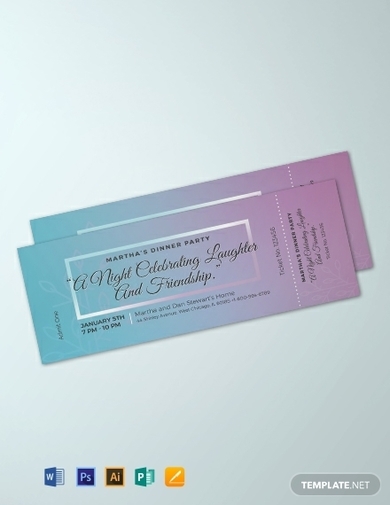 One way to invite guests to a formal dinner is through an elegant ticket design. This will make the motif of your party apparent to guests and offer them a few ideas on how to dress. You can also use the ticket as a voucher for customers to enjoy a free meal and some awesome discounts at your restaurant. This is a common marketing strategy that business owners use to drive foot traffic to their restaurants and food outlets. However, the ticket must state the terms and conditions that will entitle customers to these privileges. Otherwise, you’ll end up having a few angry (and hungry) diners causing a scene outside your restaurant. Feel free to use the template provided to craft your dinner ticket in a jiffy. The night before the wedding ceremony, it’s common for couples to host a rehearsal dinner with their closest friends and family members as a way of celebrating the journey they are about to embark on. To gather guests in one venue, invitation tickets are sent out weeks before the rehearsal. This is done to secure the presence of the chosen recipients and to make sure that they are well informed about the matter beforehand. The purpose of the ticket is also to ensure that those who came to the venue were invited by the couple in the first place. Keep in mind that formal events like these are pre-arranged and those who are a part of the guest list have already been accounted for, so any plus ones or uninvited guests are sure to add some extra charges to the final bill. For this reason, it’s best to inform recipients about the strict policies of the rehearsal dinner through the ticket. 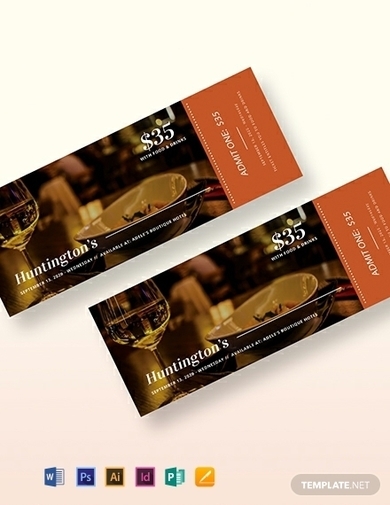 A dinner ticket template may be used for various occasions. This includes company parties, charity balls, weddings, birthdays, bridal showers, and bachelor parties. 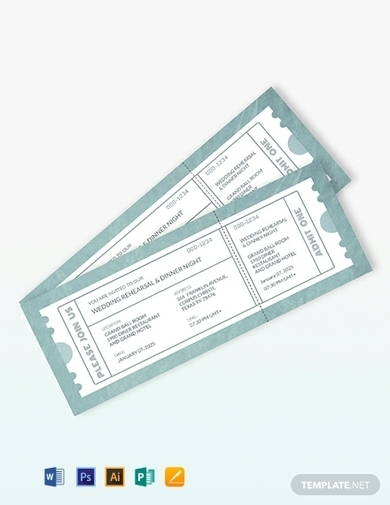 Formal award shows and conventions even use ticket invitations to allow people to enter the venue of an exclusive party. Designing a ticket for these events is extremely easy with the help of the template provided. Simply edit the content of the ticket with your own written copy and graphics for it to meet the standards and specifications of your personal brand or event. This will spare you from the stress and pressure of designing a good ticket within a short span of time. By doing so, you’re left with enough time and energy to focus on other arrangements for your dinner party. Most nonprofit organizations host charity events in an attempt to support their cause. The proceeds generated from ticket sales are then used to fund a campaign or program intended for the organization’s beneficiaries. 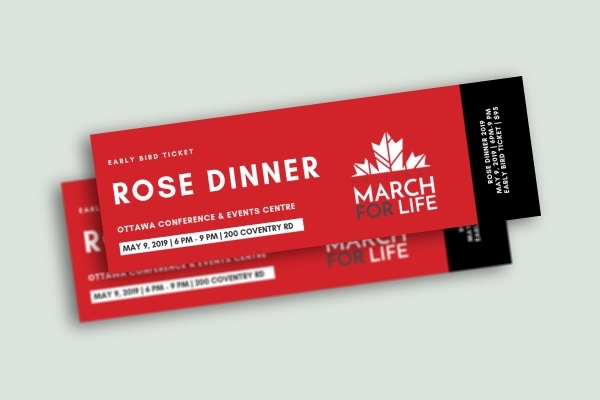 Fundraiser tickets are pretty popular in different communities being one of the most efficient methods of drawing attention to a social problem and raising money to benefit the victims or participants of such. 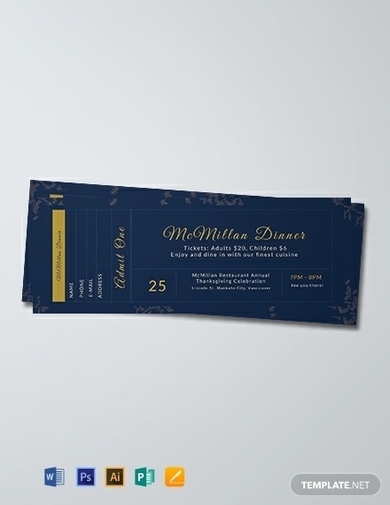 Shown above is a good example of a dinner ticket designed for a charity function. The name, date, time, and venue of the event are some of the primary elements of the ticket that must be included to keep holders informed. Without such, your inbox is bound to be flooded to inquiries and questions that could have been answered through the event ticket. Another clever fundraising concept that has been practiced by many organizations across the globe is the elimination dinner. Here, tickets are drawn one by one to eliminate the specified holder from winning the grand prize. The last person holding the ticket will then be declared as the winner of the contest. It’s an exciting way to gain sponsorship for your program without having to spend a fortune on prizes. In most cases, this will also encourage more participants to attend the event and contribute to the cause. But for guests to be eligible to join the contest, they have to purchase a dinner ticket from an authorized seller. Thus, the ticket should relay details about the event in a clear and direct manner to avoid confusion.